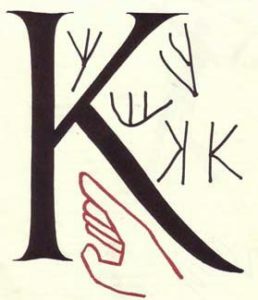 The hand image evolved through Egyptian, Phoenician, Greek writing into the Roman capital K.
The Alphabet Mural by the late Gobin Stair, resident of Kingston, celebrates the development and the necessity of literacy. The mural was dedicated to the Kingston Public Library on January 5, 1995. Our country leads the world in creative communication. We are developing the ideas, and the means, and the audience. Kingston, with its new public library, is participating in this modern achievement. We are so used to our literacy – to our memories, to our thinking and the expression of thought – that we seldom add up the values of our books, computers, reading time, schools, discussions, papers, TV and radio, CD’s, the wonder of our English language and the thoughtfulness of librarians, teachers, preachers, and readers. Nor do we think of the great tradition that evolved this visual and mental cultural ability from the times of the Reindeer Man to 1995. It took human beings thousands of years to develop the image of an ox into an A that we agreed meant A and sounded A. Early people must have had a spoken language, but we can’t tell much about that because the sounds didn’t last. But the images and signs painted were on cave walls and carved into stone and scratched into clay. But give the drawing a bow and the idea was hunter. First it was the Sumerians and the Akkadians who kept temple records and agricultural and educational notes. Then the Phoenician traders developed their cuneiform writing. They used a wedge-shaped stick to mark clay, and this became not only an accounting system but a recording of the spoken language. 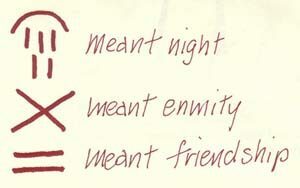 Traders in the eastern Mediterranean lands kept records with these symbols, so an agreement on meanings had to be clear. scribes were trained from their childhood and were able to represent ideas as well as objects. The Egyptian hieroglyphs represent objects or beings: pictograms; expression of ideas and sounds: phonograms; and signs to determine which is meant. The Egyptians were able to communicate their language but they did not have an alphabet. What was needed in our cultural evolution was a manageable number of signs and letter shapes that stood for the sounds and meanings of language. The Greek and Etruscan letter shapes, handed on to the Romans as the basis for European culture, do not seem very dramatic for such a great achievement. Even the shift of reading from right to left to our way of left to right happened quietly. The Romans carried on the Greek letter shapes and their classic thinking. The capital letters that serve as the backbone of The Alphabet Mural are the 26 letter shapes derived from the great column erected by the Roman emperor Trajan in 113 A.D. These classic capitals are still used by us to orient our agreement on the true shape of each of the 26 letters. Even though the Middle Ages wrote out the Bible by hand, time after time this strong discipline held its own. With the development of printing in the Renaissance we came into our present use of the ABC’s. The Alphabet Mural calls attention to a major human accomplishment. It also declares our awareness of responsibility to meet the need of readers here in our growing Kingston. We read in order to get on the Expressway, to open cereal boxes, to get through school. This literacy is one of America’s greatest achievements, so a library – a good library – is important to us. When I was nine years old, back in 1921, I discovered how important libraries and the books they offer us can be. My family was grieving over the death of my sister Sue. Father was looking for a job, and I was escaping to the back seat of our 1919 Dodge touring car to read a library book about Dorothy and the Wizard of Oz. What a miracle imagination is! I have treasured books ever since, and designed and published them. The many typefaces and their use in book design have been a lifelong joy. This mural is a way of saying “thanks”. We use the library and need the gift of literacy developed by our old ones. The story of “The Alphabet” told here is in the books shelved here. Look it up. 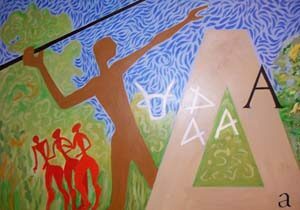 Like the spear about to be hurled from one side of the mural to the other, the alphabet is a tool, one we use to express our ideas and emotions. And like the alphabet, libraries are tools. Libraries make available the collected ideas of humanity, ideas that can help us understand our world, our neighbors and ourselves. The alphabet has been the means to record our human heritage. It is my firm belief that we will continue to value the library’s role in preserving that record and making it accessible. I find it absolutely appropriate and very gratifying that Gobin Stair has created this celebration of the alphabet especially for installation in the Kingston Public Library. This is a significant recognition of the value of the library and an honor for Kingston. 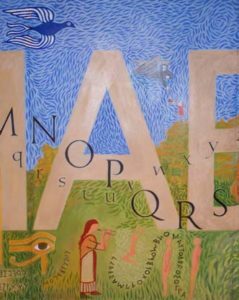 The alphabet has a complex history, as Gobin Stair has illustrated in this complex mural. Looking at the mural we see the very dawn of humans as tool makers and users. Fire is one of the earliest and most basic tools humans learned how to use, and the spear is one of the earliest we created for ourselves. The vigor of the spear thrower’s stance expresses the triumph of that achievement. 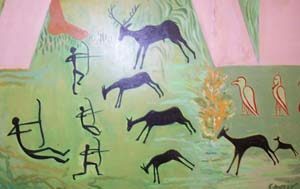 It is no accident that the trajectory of his throw will land the spear squarely at the end of the mural, in the present, the beginning of the future and the unknown. What is the significance of the spear the thrower is poised to hurl? A spear is a means for accomplishing a task, and so, of course, is the alphabet. Through the alphabet we have access to thoughts, ideas, and events far beyond our individual experience: the alphabet links the present, past and future and joins us all to a common humanity. The up reaching hands at the beginning and end of the mural embrace the whole and remind us that this history of humanity’s tool belongs to each individual. It is our common heritage. The path of the spear brings us through the history of humans as communicators who used a splendid array of pictures, cuneiform, hieroglyphs and letters. The shapes of these symbols reflect the instruments and materials of each period and point to the importance of function in developing the form of the alphabet we know. The sturdy capital letters ALPHABET provide the backbone of the story, while the elegant, fluid letters of the Roman alphabet carry us beautifully to the modern clean block of Bookman letters, and the stenciled military letters. And we may well wonder what will come next in this long story. 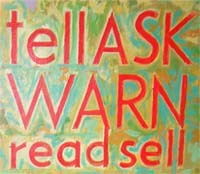 The artist has given us the robin, as symbol of spring and hope, as well as the more ominous and somewhat disturbing “tell ask warn read sell” that hint at our responsibility to think and communicate our ideas for the common good. One of my favorite images in this mural is the mass of people walking forward. This image carries many meanings: each person is an individual and different from the others, yet all linked in a movement that makes them operate almost as a unit. To me, this group stands for hope, progression, survival, diversity and strength, as well as ignorance, blindness and stupidity. And these are all aspects of the human condition. We have so much potential for both good and evil that it behooves us to learn from our common experiences how to encourage the former and avoid the latter. 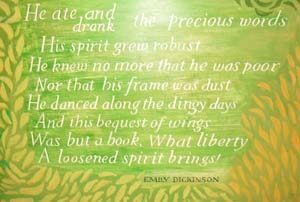 The Emily Dickinson poem is appropriate in many ways. We hear clear echoes of the Book of Genesis in the lines “ate and drank the precious words” (In the beginning was the Word); “he knew no more that he was poor” (Adam and Eve knew they were naked when they ate of the fruit of the tree of the knowledge of good and evil); and “his frame was dust” (God made Adam from the dust if the earth). And the story of the mural begins with the genesis of the alphabet. Books bestow a “bequest of wings” and a “loosened spirit”, recalling the grace of the hunter who is about to launch his spear through the ages of the alphabet, which is our own bequest of wings. In 1956, Gobin came to Boston as production manager and art director for Beacon Press – and to Kingston to live and paint. 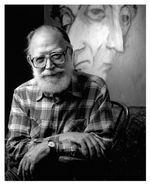 He was appointed director of Beacon Press in 1962, and in 1971 made the Pentagon Papers available to all Americans, after all the major publishers bowed to governmental pressure and refused to publish them, thereby earning an entry in “Who’s Who.” He designed and developed the Beacon Paperback line and illustrated editions of Swift’s Gulliver’s Travels and the King Lear Experience. In 1975, Gobin retired from Beacon Press and began painting full time. His work – watercolors, oils and now acrylics – has been shown over the years at galleries and museums in New York City, Providence, R.I., Boston, Cape Cod, Hanover, Duxbury, and Kingston. He also has published his own book, True to Form. Gobin passed in 2008, at the age of 96.